Need a poster but do not have a design? Or have an idea but need help with the layout? Please contact us to be connected directly to our Design department. Or if you have a designer or have designed the poster yourself, use the guidelines below for the optimal print quality. We require a minimum resolution of 100-150 dpi at 100% print size, or 200-300 dpi at 50% print size on all Raster Based designed and submitted files such as TIF, PSD, JPEG & etc. Vector based files such as EPS or AI. Resolution is irrelevant and files can be reduced or enlarged to almost any size without losing print quality. Example: 22" x 28" required finish size poster. setup file to 22.25" x 28.25"
We require that you convert all fonts to Outlines / Curves where possible before submitting your design art file. Save your design in CMYK MODE, we can also work with RGB files however we will be converting all RGB colors to CMYK mode prior to printing and this may cause shift in colors. (24 hour poster is not responsible for any color shifts.). We always recommend sending a flattened file. We recommend submitting files at 100% final print size. If not possible you may also design and save your graphic files at 50% (200-300 dpi) or 25% (400-600 dpi) of final print size. (Your final file size will be determined by what you entered on the home page in inches.). For the best results on printing SOLID BLACKS (Excluding text smaller than 30 pt. )use C=60% M=40% Y=40% K=100%. We only print 4 color process (CMYK). If you use Spot or Pantone colors, please have them converted to process colors (CMYK) prior to submitting your file. We will try to match as close as possible. 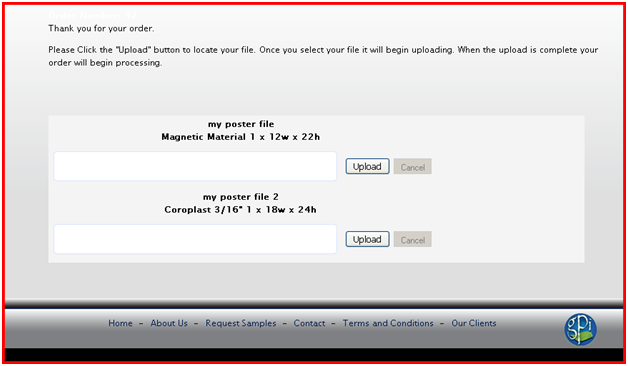 Once you have finished the order process you will be provided a browse button to upload your file. final size. Any scale is accepted. 3. Submit hard copies with files. all art used in files. 6. Submit both screen & printer fonts.